This painting is remarkable in its vivacity and vibrancy of colour, depicting a dynamic still life arrangement with skillful resolution of objects. It encapsulates Godfrey Miller's ideological search for unity; the fundamental interconnectedness of all matter in a disparate, fragmented world. Objects are absorbed into the grid system covering the entire picture surface, characteristic of the artist's idiosyncratic cubism. 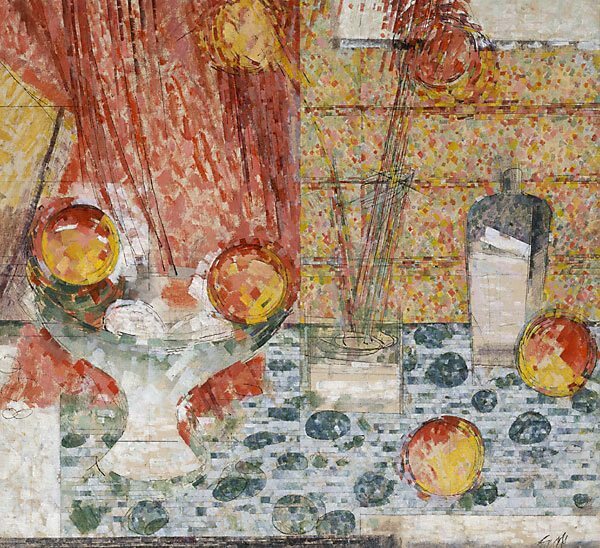 The painting's sparkling patterns, judicious placements and dynamic movement between vibrating spheres of fruit form part of the artist's expression of his life-long interest in spiritual and scientific systems. Miller was deeply cerebral and philosophical in his quest to create work that accorded with his views on art and life. Trained initally as an architect in New Zealand, he studied and lived around Melbourne during the 1920s, then settled in Sydney in 1939 following extensive travel in Asia and Europe and a decade of study in London. Signed l.r., black ink "GM". Not dated.